Acupuncture needling and catgut imbedding for deducting body weight, treating acne, pigmentation, chronic urticaria have been achieving encouraging progress. The acupuncture dept has over 30-years experiences of winter diseases to be treated in summer for those diseases as: recurrent respiratory tract infection, chronic bronchitis, asthma, chronic pharyngitis, chronic colitis, rheumatic arthritis, rheumatoid etc. Its effectiveness is undoubted, and become one of the main characters of Chinese Medicine. Meanwhile, the department is undertaking over 20 of state-level, province-level and bureau level research subjects for treating low limbs arterioschlerosis, intestinal paralysis, warts etc. Some researches have been accomplished and 5 subjects have been awarded with provincial prize. from a dozen of different countries. It is one of the biggest clinical training bases for foreign students in Zhejiang Province. Many doctors in this clinic have been dispatched to those countries as Holland, Poland, Italy, Japan, Australia, Canada etc for delivering lectures, academic exchange, or providing clinical instruction, they had received well praise from home and abroad. Dr. Xuan Lihua is a Chief Physician of Chinese Medicine,doctoral supervisor, director of Acupuncture Dept-Zhejiang Provincial Hospital of TCM. She is a Provincial Notable Physician of Chinese Medicine,one of the second batches National Excellent Clinical Talents of Chinese Medicine,chairman committee member of China Acu & Moxi Academy, chairman committee member of Clinical & Shu Points Branch, and vice chairman committee member of Abdominal Acupuncture Branch. Dr. Xuan has over 30 years clinical experience, specialized in treating facial paralysis, pain problems, lower limbs arteriosclerosis, allergic rhinitis, urticaria and other difficult?miscellaneous?diseases by body acupuncture and abdominal acupuncture. She is in charging and participating over 20 research projects. 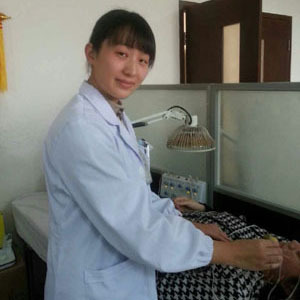 Her clinical research subjects of "Thick Needle Treating Facial Paralysis", "Treating Winder Diseases in Summer" have awarded Zhejiang Science & Technology Development Second Prize. 6 other research subjects have awarded Zhejiang Science &Technology Development Third Prize and Zhejiang CM Science & Technology Innovation Second Prize; over 70 essays have been published, two of her research achievements have obtained national invention patent. Dr. Xuan is also the chief editor and vice chief editor for two works, excellent clinical teacher for local and foreign acupuncture trainees. Dr. Xu Fu is an Associate Chief Physician of Chinese Medicine, deputy director of acupuncture dept, master of medicine and tutor of postgraduate, committee member of China Acupuncture & Moxi Academy and Zhejiang Acupuncture & Moxi Academy, vice chairman committee member of Pain Branch, committee member of Zhejiang Acupuncture Recovery Association. Over 30 years clinical practice, Dr. Xu Fu has accumulated rich experience in treating insomnia, CVA, Hyperlipidemia, facial paralysis, osteoarthrosis, obesity, and other frequently-occurring diseases and difficult miscellaneous diseases by his special wrist & ankle acupuncture and body acupuncture. 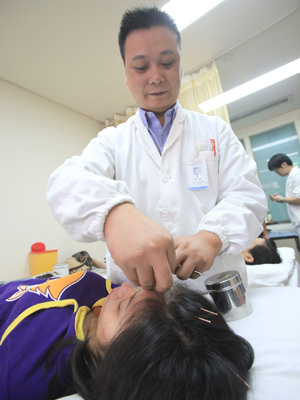 He is good at using needle manipulation to tonify and clear body, combining needle techniques with herbal medicine to achieve double outcome. Meanwhile Dr. Xufu also in charge and participating in 8 national and provincial research subjects, over 20 essays have been published in the past years. Dr. Xu Yonggang is an Associate Chief Physician of Chinese Medicine, committee member of Needle & Knife Brach-Zhejiang Chinese Medicine Academy, committee member of External Treatment Branch- China Chinese Medicine Academy, a Claims Examiner of CM Doctor Practical Skills Qualifications Examination in Zhejiang Province, Examiner of Blind Massage Practice Skills Qualifications Examination. Dr. Xu has 20 years clinical experience of acupuncture, specialized in treating tinnitus and epicophosis, cervical spondylosis, pains diseases, gonarthrosis, scapulohumeral periarthritis, insomnia, tennis elbow, asthma, tourette syndrome, and obesity. His special technique of Jing Triple Needles is very popular because of fewer needles less pain and good results. Dr. Xu has been in charging and participating 4 clinical research subjects, 2 subjects has awarded Zhejiang Province Chinese Medicine Science & Technology Innovation Second Prize, over 20 essays have been published in deferent kind of medical journals, editors 8 Chinese medicine works. Dr. Mo Xiaofeng is an Associate Chief Physician of Chinese Medicine, Vice Chairman Committee Member of Youth Council of Zhejiang Acupuncture Academy, and Claims Examiner of CM Doctor Practical Skills Qualifications Examination in Zhejiang Province. Dr. Mo has over 20 years clinical experience in treating those disease as vertigo, headache, facial paralysis, trigeminal neuralgia, chronic pharyngitis, rhinitis, chronic diarrhea, gastritis, obesity due to immune disorder, acne, pigmentation, menopause syndrome, sub-health status, refractory insomnia, degenerative arthritis etc. Her emphasis on symptoms differentiation with diseases clarification, oral herbal medicine together with external acupuncture, especially in treating women diseases, it has been achieved remarkable effectiveness. Dr. Mo is one of the fourth batches successors of national TCM academic experience of old heirs. She is in charging and participating in many bureau level and provincial level research subjects, over 10 essays have been published on different medical journals. She is also the chief editor and vice chief editor of many works. Dr. Wu Xiang is an attending doctor of Acupuncture, post-graduate, graduated from Zhejiang Chinese Medical University; He is accumulated rich experience in treating autoimmune disease such as urticaria, allergic dermatitis, allergic rhinitis, facial paralysis, Sequelae of stroke, gynecological diseases, autoimmune and neurological disorders, obesity, irregular menstruation, etc. Dr. Wu is also participating in several provincial research projects, and involving in teaching domestic and oversea students, he is a bilingual teacher, excellent in English. Chengdu University of Traditional Chinese Medicine, his main research interests are acupuncture treating metabolic disorders, gynecological diseases, auto-immune disease and neurological diseases. After 6 years practice, he is accumulated rich experience in treating obesity, abnormal glucose level, irregular menstruation, autoimmune disease as urticaria, allergic dermatitis, allergic rhinitis, facial paralysis, neck & shoulder pain, lumbago, Sequelae of stroke etc. Dr. Wu is also a one of the main instructors for domestic and foreign acupuncture trainees. He is a bilingual teacher, speaks excellent English, participating in clinical teaching and lecture translation, meanwhile he is engaged in several provincial and health bureau research projects. Dr. Chen Shan, M.M.D, a graduate from English class of College of Acupuncture and Moxibustion, Shanghai University of Traditional Chinese Medicine (TCM) in 2009. From 2009 till now, she has served at Zhejiang Provincial Hospital of TCM. She specialized in treating pains, facial paralysis, facial spasm, hemiplegia, dysmenorrheal, postpartum deficiency of the body, postpartum body pain, urinary incontinence, urethral syndrome, pelvic pain syndrome and chloasma by acupuncture, moxibustion, abdominal acupuncture and herbs. She also performs suture embedment to treat obesity, irregular menstruation, constipation and applies acupoint plaster to the treatment of allergic rhinitis and allergic asthma. Dr. Chen published 4 papers and joints a scientific research, which is a clinical observation of acupuncture according to Brunnstrom grade combined rehabilitation training on upper limbs motor dysfunction after stroke-funded by the Zhejiang Administration of TCM in 2013. With an enthusiastic and cheerful personality, she served as a translator for oversea students in affiliated hospitals of Shanghai University of TCM and a voluntary simultaneous interpreter during college. She was a translator for students of medical college of Ohio State University and Reidman College of Israel and a teacher for students from school of advanced TCM studies of Hong Kong University in Zhejiang Provincial Hospital of TCM. Dr. Zhang Qifei is a resident doctor, Bachelor of Medicine, graduated from Guangzhou Chinese Medical University. She is specialized in treating diseases with acupuncture & moxi combined with herbs, has accumulated rich experience in treating stiff neck, back pain, facial paralysis, sequela of apoplexy, pain syndrome, irregular menstruation, infertility, beauty therapy, weight-reducing by thread planting (cat-gut), etc. She is also an excellent clinical training instructor for domestic and foreign students. Dr. Ren Jianlei is a resident doctor, Bachelor Degree, graduated from Zhejiang Chinese Medical University. His research direction is acupuncture treating metabolic disorders, pain and neurological problems, autoimmune disease, such as obesity, urticaria, allergic dermatitis, allergic rhinitis, facial paralysis, neck & shoulder back pain, Sequelae of stroke, etc. 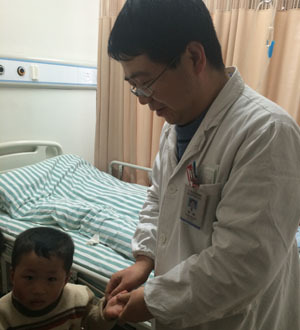 He is one of the main doctors in inpatient dept of acupuncture, has been treating many severe cases, such as CVA, cerebral paralysis, lumbago, migraine etc. Dr. Ren also involves in clinical teaching for domestic and foreign students, and participating some clinical study projects. Dr. Yu Binyan is an attending doctor, Master of Medicine, graduated from Zhejiang Chinese Medical University. She is good at treating metabolic disorders and Gynecological diseases by acupuncture, such as obesity, irregular menstruation, autoimmune disease, urticaria, allergic rhinitis, facial paralysis, neck shoulder back pain, Sequelae of stroke, etc; she is participating in several research projects, 8 papers has been published, and wrote 2 acupuncture books. She is also participating in clinical translation and instruction for overseas students.